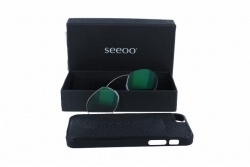 Seeoo glasses are designed traditionally and are intended for reading. The particularity of their designs is that they do not have temples, they are just the frame and the bridge. Its manufacturing process stands out for its union between the artisanal process and the latest technology, creating an authentic product, durable, comfortable and effective. All products from the brand offer the perfect style, protection and carefully chosen colours. In this way they achieve a very elegant product. This brand has different models of reading glasses inside their catalogue. Their designs have a wide variety of colours. Among them you can find the one that adjusts best to your tastes. Furthermore, you can also find acetate or rimless frames. The brand has two models that stand out from the rest: Seeoo Classic, with acetate borders and steel bridge. Their lenses are made with the best Swarovski crystals. 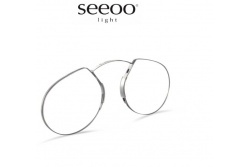 On the other hand we can find Seeoo Light, that includes bigger lenses.They stand out for its lightness and transparency, creating a discreet model. In our online shop you will find the best Seeoo models at best price. During the purchase process you can ask any doubt to our professional team. The manufacturing of these glasses was born when the Seeoo creator, Gerald Lasnik, found in his attic some old glasses and watch that belong to his grand-grandfather. In this way, Lasnik affirms that his company is based in passion and love for real things.